The Mario Toy Company has produced the new, amazing Mini-Mario toy. Unfortunately, Donkey Kong takes the commercial's advice to "collect them all" too far, and raids the Toy Factory. Not happy to see all of his new toys stolen, Mario sets off to reclaim the cute toy plumbers. 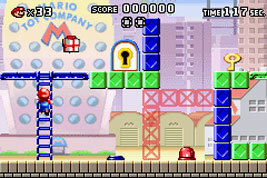 Mario has to collect keys and carry them to the door on each stage. To get the key to the door, Mario will have to climb ladders and hit coloured switches. In the second part of each stage, Mario has to find the Mini-Mario. Mario then has to lead all the Mini-Marios into a toy box and then battle against Donkey Kong. Get	high scores and earn Stars to unlock even more levels.